I saw this and just had to share a picture of this 800 watt $75,000/pr Monoblock with you guys. That's um, er, ah.....different. I wonder how much of the $75k is for the "different factor"?!? I gotta ask. Do they make a matching pre? Graduate of Sony University, class of '94. If older is better, I must be aproaching magnificience! RickeyM- I found a slight correction to the price of the Edge NL Reference Monoblocks. According to Edge's website their Monoblocks are $140,000/pr and not the $75,000/pr that Stereophile Magazine quoted which I used in my initial post. Which still begs the question what does one get for their $140,000? Edge descrbe their very expensive Amplifiers as "excellent for systems that either: need or want a fair amount of power, are too bright, the listener would like to use tubes but cannot or does not want to deal with tube's negative environmental issues (heat, maintenance, foot-print)." They will mention again in the information below that the goal of all this cutting edge technology that Edge developed is a grand effort to make a high powered Solid State Amplifier that is as close as they could get to sounding like a Tube Power Amp only without the inconvenience of using Vacuum Tubes. The "NL" series of amplifiers utilize EDGE proprietary Laser Optical Bias Circuitry. This new circuit incorporates a 630 nm wavelength laser in each channel operating directly on the silicon substrate of the bias transistors. The laser bias circuit in turn is part of a servo feedback network. As the signal rises, the output of the laser increases, and as the signal decreases the laser output falls. This keeps the bias at the optimum operating point allowing a 10 fold increase in gain. The additional gain is achieved while maintaining signal integrity (linearity) - at light speed - a first for solid state amplification. The "NL" series also features oversize binding posts and up to 16* low leakage snap lock 10,000 µF caps per channel. Also the new low leakage / low field medical grade transformers are housed in magnetic stainless steel enclosures for non induction and low noise performance. Chassis construction on these amplifiers is 1/2" thick 6061 aluminum, held together with marine grade stainless steel machine screws. Heat sinks machined from solid 6061 bar stock keep transistors cool without fans. The output stages utilize up to 32* N channel bipolar transistors for extremely low output impedance. The NL Reference monoblocks are Edge Electronics' statement amplifiers. These 800 watt, 220 lb. monoblocks are very high voltage, very high current output amplifiers. The Edge Reference monoblocks continue the Edge Electronics' tradition of building extremely efficient amplifier designs. And one has to keep in mind that these are Edge Electronics watts, which are cleaner, faster, smoother and more detailed than any other solid-state amplifier being made today. Up until now, one had to use very large, 600 to 700 watt tube amplifiers to product the kind of forceful and overwhelming, yet pure and uncompressed crescendos that are required by many types of music. Unfortunately, large tube amps have problems in that they generate large amounts of heat and use large numbers of tubes that require maintenance after some amount of time. Most solid-state amplifiers are usually harsh and unpleasant to the ear, especially after extended periods of listening, and even more so when listening at loud volumes. As anyone knows who has heard any of the Edge Electronics amplifiers, they have licked this problem using their laser-biased transistors. Finally, those that want this level of performance but did not want to sacrifice the conveniences of solid-state amplification, now have the option to achieve their dreams with the NL Reference. The NL Reference monoblocks are excellent for systems that want over the top performance on a level that only a few people in the world have experienced. These monoblocks take the performance of the NL Signature Ones and extend it to the farthest reaches of what humans have so far imagined. Laser Source Front Panel Illumination (one per chassis). Dual toroid transformer-quad filar wound high nickel content core w/electrostatic shield power supply. Potted transformers in magnetic stainless steel can. Laser biased, all "n" channel bipolar output stage. 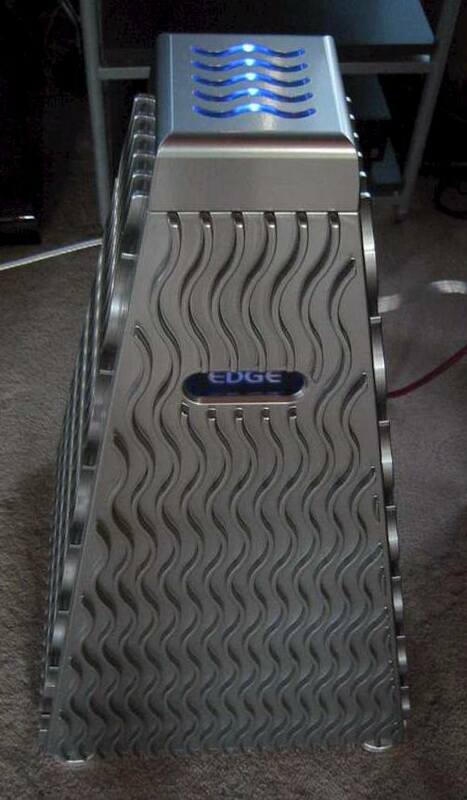 RickeyM- That said I've auditioned the $10,000 Edge NL-10 225 wpc Stereo Power Amp on many occasions with several different pairs of speakers up to and exceeding a $10,000 pricepoint and it certainly didn't live up to all of the hype nor the sound quality that one would expect at I was led to expect. Just looking at how the Edge NL Reference Monoblocks were set up in front of all those windows with a Video display between them shows that these folks are so oblivious to the absolute importance of room acoustics that they need $140,000 Monoblocks in order to get a level of sound quality commensurate to what a clever Modman with a Power Amp that cost a fraction as much could achieve in his well treated listening room! "The EDGE Signature One Preamplifier is the ultimate control center of any custom system. With battery operated true DC power supply and THD below 0.001% this component will effortlessly resolve and unveil the most demanding source material." Dimensions: 14.0" Deep x 13.0" Wide x 5.0" High. Weight: 33 Pounds. $12,268.00." RickeyM- I haven't been able to find an NL Reference Preamp yet the NL Signature is as close as I could find. Gee, put up "tube inconvience"
Gee, put up "tube inconvience" or spend about 100 times the price. Tough decision (insert sarcasm here) . RickeyM- What I see again and again is that this uberexpensive gear is purchased by guys who have more money than they have the kind of knowledge that it would take to run a moderately priced Audio system and make it sound as good or better than the more extravagant looking gear. Thanks for sharing the fun look into the EDGE mono blocks. At $140,000 a pair that is all most of us will do is look. I can't even imagine dropping that kind of money on a pair of amps. Heck, my first house was only $26,000 and I had a hell of a time coming up with the down payment and closing costs. Of course that was over 30 years ago and inflation has hit us hard. Joe- I've heard this kind of huge Monoblock before and because of all of their complicated circuitry they just aren't as nimble as smaller Power Amps are. I'll bet that if you heard the Edge Reference Monoblocks that you would be glad to get back home and listem to the much more Musical renderings of The Beast running your High Efficiency Speakers!